It’s kind of fitting that the end of the Jarome era in Calgary comes with the Flames awash in failure and uncertainty, because that’s how his time began with the team as well. When Jarome made his debut as a fresh faced 19-year old rookie in the 1996 playoffs, little did he know it would take another eight years for the club to make the post-season again. The "Young Guns" era was the last time the organization tried to rebuild in earnest and it stands are the darkest period in the franchise’s history. Jarome grew up as an NHL player amidst a weak Canadian dollar, dwindling budgets, dead puck hockey and in the long shadows of newly departed legends. Even for ardent fans who currently see nothing but gloom on the horizon, it’s difficult to adequately describe the hopelessness and irrelevancy that stained the Flames in that long winter between 1997 and 2004. Profligate spending in the league’s biggest markets was rampant, exacerbated by the imbalance between the two North American currencies. The club shed stars at a rapid rate as a result and in their stead sold hope to the an increasingly weary and apathetic fanbase by signing the less capable brothers of recognizable players. Even finishing at the bottom of the standings for consecutive seasons failed to deliver any sort of meaningful respite from despair: the club chose Daniel Tkaczuck and Rico Fata with back-to-back sixth overall picks. Enduring, perpetual failure never seemed more certain in those days. Flames fandom at the time was little more than a grey, featureless landscape bereft of a discernible horizon. The Calgary Flames were the league’s weak sister, an also-ran, a punchline. Like a new tree that takes root in the ashes of a devastating forest fire, Iginla grew into a towering presence in Calgary, a figurehead who led the franchise out of its dark ages, establishing the Flames organization as relevant in the eyes of its enemies and in the hearts of its fans again. Even before Darryl Sutter, Miikka Kiprusoff and the uncanny playoff run, there was Iginla; singlehandedly laying waste to the league in 2002 (52 goals, 96 points) and scoring Olympic golden goals. Not many fans remember this anymore, but Iginla’s stardom wasn’t immediate like, say, Crosby or Ovechkin. His emergence was far more slow and gradual, marked by doubts and uncertainty. He was a late addition to the 2002 Olympic squad, at the time still considered merely a pretty good player on a pretty bad team. 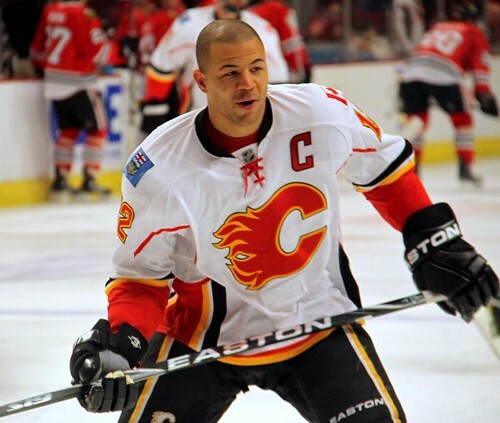 But Iginla eventually transcended the expectations and labels that so undermined the Flames at the time. He became the reason to watch Calgary on any given night, an unstoppable force of strength and will. He was an oasis in a desert of mediocrity and failure, a beacon of hope to a fanbase that had become numb to the near incessant drip, drip, drip of failure. As such, Iginla wasn’t simply a great player for this team and this city, not merely a captain of the club or a Saturday night highlight reel. He was the symbol of Calgary’s resurrection. The catalyst of its renassaince. Which is why, beyond all the on-ice concerns, it was so hard for the Calgary Flames franchise to finally move him and for the fanbase to accept his departure. Iginla was a ray of light in the team’s darkest hour, a savior from despair. To see that light extinguished in Calgary, however inevitable or unavoidable the outcome, makes the fans and city feel a little colder and a little darker. There are three things that pretty much stand out to me about Jarome Iginla, I would say. All of them, I should think, will come up from other people as well as me. I certainly don’t think this will be ground-breaking or revelatory. The first is The Shift, which is still one of the most incredible things I’ve ever seen a hockey player do. He played for so long and so hard and was the ultimate highlight of everything that was wrong with the old NHL before they changed all the rules. That’s what a captain does in the tough situations, I think. That’s what makes Jarome Iginla a legend in this city. He left everything on the ice, did it all, and still didn’t get the big prize. Tough to see. The second is the Trevor Linden handshake thing. That was just a bananas display of respect for an opponent he had every right to dislike given how heated things got throughout the latter years of the Canucks/Flames rivalry before the former started running away with the division every year. I don’t know if Linden was right when he called Iginla the best player in the league, but something like that, well, it was just unbelievable to see. No one else in the NHL would have done that, but Iginla had guys coming back out of the tunnel. Man, this week. It’s just completely beaten me down on so many levels. It’s hard to know where to start with what Jarome meant to me – I’ve never known this team without him. Personally, I knew him better than most; hell, we even had him at our house for dinner a couple times. It’s just really tough to see this franchise in this state. Iggy was really the last unbroken link in the chain that is my fandom: tragedy after tragedy, but Iggy was the constant. The best player to ever put on the Red and Gold deserved better from this franchise as a whole. …the thing with legendary moments is that you can describe them in the most generic way possible, yet the moment itself is able to be simultaneously identified with an amazing, exacting specificity. I say "The Shift" and every Flames fan on the planet immediately knows what I’m talking about. Thanks for everything, Iggy. Calgary won’t ever be the same. Go get that Cup. It’s hard to pick just one moment that Iggy has left an impression over the past sixteen years. When you often think of any of the great moments that the Flames have experienced, even through other players, Iginla is usually involved. Having been fortunate enough to be present for many of his milestones, it’s hard to narrow it down to just one. There is no doubt that he is the best player that has ever graced this organization. Therefore, I think I have to look at also what he meant as a man to this team. His countless charitable acts to the community and just how much he has meant as an ambassador to the game itself. One of my favorite Iggy moments actually came in concert with one of the teams I hate the most; the Vancouver Canucks. That’s right, Trevor Linden’s last game with the Canucks. It was a game where Iggy clearly stole the spotlight on the ice. Who could forget Iggy’s extended ironman shift towards the end of the game, where his teammates tried so desperately to get him that 50th goal. When he finally got it it wasn’t the game winning goal by any means, afterall, the Flames were laying a beating on the Canucks. But the Captain handled himself with poise and grace, as he has always done. By the end of the game, the Canucks were not going to the playoffs and they had just been beaten down by a division rival, the only thing left was to celebrate a truly phenomenal career from Linden as a Canuck. As the fans roared in appreciation, Iginla realized, with class, what was needed to be done. And so he led his teammates back onto the ice, so that they too may pay their respects to one who truly deserved it. The gesture was not only appreciated and recognized by Linden, but also the Vancouver faithful. Iggy demonstrated that "the game" wasn’t just about what jersey you wore or what milestones you hit. Sometimes it’s just about the man. That’s how I’ve been feeling since he got traded. Was it necessary for the team to deal him? For all intents and purposes, yes. But am I happy about him leaving this team, this organization, no. I wrote my very first article for FlamesNation about Iggy and what makes an elite player elite. I read it again last night, and I stand by every word to this day. Sometimes… It’s just about the man. Like most Calgarians, I have had the occasion to bump into Jarome Iginla around town. But it wasn’t until I started covering the Flames that I had the chance to see him on a regular basis. It was clear as day that he was a tremendous hockey player – he has the hardware to prove it – but the amazing thing was how composed and calm he was. While other players are occasionally a bit aloof or nervous around the media, Jarome Iginla was always at ease. Whether he was being grilled about the team’s performance following a loss, or talking AHL recalls, or discussing his memories of the World Juniors or his first goal, he was always a consummate professional and just a very nice guy. From the first time I interviewed him – several training camps ago – until his last post-game scrum following the St. Louis game, he always spoke from the heart and made interviewers feel like we were doing him a favour asking him about things. Best of luck in Pittsburgh, Jarome. Jarome is the classiest player in the NHL period. Believe me, he will be missed here in Vancouver also.And it is not for what he did when Linden retired ,but for his courtesy to reporters , his fans and the like.I think I have just become a Penguins fan.